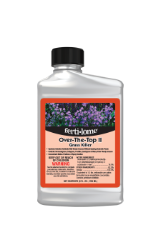 Controls Annual and Perennial Grass Weeds. Can be used on vegetables, gardens, trees, shrubs, and ornamentals. Absorbed by foliage and travels through entire plant. Systemic selective broad spectrum post-emergent herbicide that can be sprayed over desired plants listed to control annual and perennial grasses. Can be used on vegetables, gardens, trees, shrubs, ornamentals and ground covers. Stops growth of weed grasses within 2 days.